Jenny Jones Wood has a love for real estate and surrounded herself in many facets of the real estate world from a very young age. Jenny obtained her first real estate salesperson license at the age of 18 in Arkansas. Upon graduation from SMU with a BBA in finance and accounting, Jenny worked for Ernst & Young, LLP in Dallas as a real estate consultant where she raised money for real estate investors and valued and priced an upscale ski resort. While at E & Y, she also valued a portfolio of nursing homes across the country for a large investment fund based in New York City. 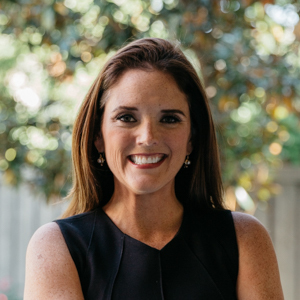 Jenny graduated from SMU’s Dedman School of Law and practiced real estate law for Kane, Russell, Coleman and Logan P.C., and also worked as Associate General Counsel for a shopping center developer - Weber & Company, Inc.
Jenny is an active member of her community. She is a member of the Junior League of Dallas, a volunteer at the Dallas Arboretum and a member of the Family Place. Jenny and her husband, Nathan Wood, live in Preston Hollow with their daughters and attend Highland Park United Methodist Church.